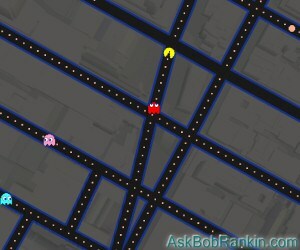 If you love playing Pac-Man, and hanging out in Google Maps is your idea of fun, then you're going to love this. Go to Google Maps, navigate to some interesting place, then click the Pac-Man icon on the bottom left of the screen. Turn on the sound, for the full effect. Google says this game will only be around "for a little while," so don't miss your chance to waste hours of your employer's time today! We're Number 2! China leads the world in Internet attack traffic, according to Akamai's State of the Internet Report. 41 percent of all attack traffic (botnets, denial of service, and other malicious activity) in the 4th quarter of 2014 came from China. The USA trailed with only 13 percent. Nothing new under the sun... Israeli security researchers have discovered a way for computers to communicate via heat emissions. Maybe they got the idea from early civilizations that used smoke signals. Prison inmate Neil Moore used a smuggled mobile phone to register a domain name that looked like that of a UK court, then sent prison officials an email, purportedly from a court clerk, ordering his own release. It worked. File Under Obvious: Researchers at the Center for Pattern Recognition and Data Analytics say they have found an association between Internet searches and behavior. Svetha Venkatesh, one of the study’s authors, was apparently stunned when he saw that "a trip to the gym may be predicted by a search for the gym’s hours… Or an order for food delivery might be predicted by a search for a food delivery company." More troubling, Venkatesh says that data from search trends could predict the need for changes in healthcare policies and "other interventions." The bionic ant made by Fesco, a German engineering firm, has ceramic limbs, 3D-printed body, a mouse’s optical sensor in its thorax, and antenna battery charging contacts. It can scoot around factory floors or a teenager’s bedroom, tidying up. Mobile banking is booming, according to a report from the Federal Reserve. Nearly 40% of consumers use smartphone apps for online banking, and a whopping 50% of those have used remote check deposit apps that let them submit a snapshot of a check instead of the paper article. Now is the time to buy mass storage before its price skyrockets. This year, a total of 4 zettabytes (4 billion terabytes) of data will be generated, but by 2020 that will balloon to 40 zettabytes. A researcher at Gartner is predicting that disk manufacturers can’t increase production that fast, so prices will explode. Facebook has released its transparency report detailing requests from law enforcement and other government agencies for users’ data. In nearly 15,000 cases, Facebook provided some user data 79% of the time. RadioShack’s bankruptcy could give the names, addresses, and phone numbers of 100 million customers to the highest bidder. In other news, RadioShack once had 100 million customers. Web sites should be easy to navigate even when “The User Is Drunk,” and for only $250 this Web developer will get smashed and test your site for you. Most recent comments on "Geekly Update - 01 April 2015"
I am saddened, to hear the RadioShack is in bankruptcy. I knew, when I needed something quickly, computer wise, I could always go to a retail RadioShack store, and pretty much would find the product or component. Even Newegg, doesn't have what I need, most of the time. Newegg now sells, way too many things, for my taste. Plus, there are way too many sellers, on Newegg!!! I am very disappointed, with Newegg. I guess, the computer world is having to compete with almost everybody, to survive. I never liked the idea of giving my personal information to Radio Shack. Now I know that my idea of giving this fake information was the right thing to do. Wait a minute. Someone is getting PAID $250.00 to get drunk? Boy, did I ever miss a career opportunity in my drinking days, er, years. Well, Bob, I just wasted 30 minutes re-learning how to play Pac Man. Thanks. Gotta say, it was fun, though--especially with the speakers up loud! What started as Radio Shack in Canada became "The Source" when they pulled out. The Source is going strong, paying shareholders dividends, hovering around $32/share. Consider: Radio Shack in Canada was the same as the US stores that Canadian shoppers loved before they got here, and still love after they left. Target shows up in Canada, but they open "special stores for Canada shoppers (sic)", exactly the opposite of what Canadian (note: Canadian) shoppers wanted. We wanted to shop at Target, not at whatever that was. So Target croaks leaving 17,000 unemployed and huge debt. Oh, and they paid the genius who dreamed this nightmare up a cool $54 million. Moral: If you want to come and do business in Canada, do it based in the "The Source (Radio Shack)" model, not the "Target" model. RIP, Radio Shack. Glad you left before you got my email info. "Now is the time to buy mass storage before its price skyrockets. This year, a total of 4 zettabytes (4 billion terabytes) of data will be generated, but by 2020 that will balloon to 40 zettabytes. A researcher at Gartner is predicting that disk manufacturers can’t increase production that fast, so prices will explode." So how do I determine how much I should buy now? Surprised Russia is only 3.25% on the malicious sites countries and Nigeria isn't even on it. Now back to PacMan!